“Tekel! You have been weighed in the balances and found wanting!” Dan. 5. Behold the hand of a deer! 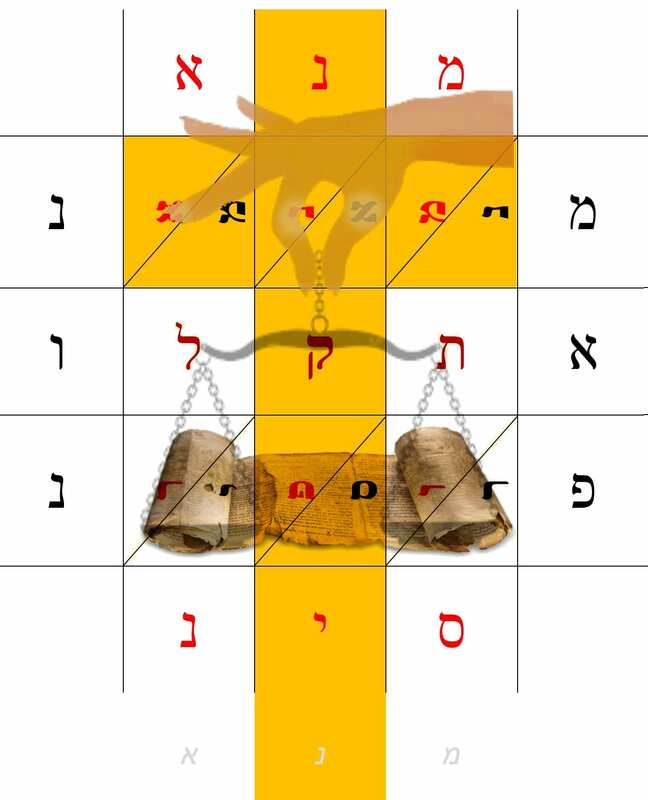 Because with His hand, “The Doe of the Morning” weighs “the strong bulls of Bashan” (פר פר) in the Balances. The strong is defeated in weakness. “Let him that glories, glory in the cross.” Ps. 22:1,12. The original version of this post is in rough form at www.sure.foundation. 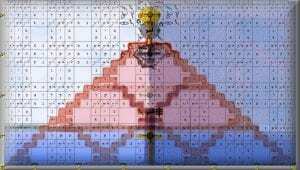 It contains a partially encrypted message. This post explains that message more clearly. The message is not primarily intended for men. "His intent was that now, through the church, the manifold wisdom of God should be made known to the rulers and authorities in the heavenly realms, according to his eternal purpose that he accomplished in Christ Jesus our Lord" Ephesians 3:8-11. Side view of the Tower of Babel. Mene Tekel Parsin Matrix. Altar at “The Place of The Skull”. This will be explained slowly as we proceed. Top view of an altar atop the Tower of Babel — from God’s perspective. Ezekiel’s altar and temple-complex are similar in design. The gods of the nations have mimicked God’s pattern. 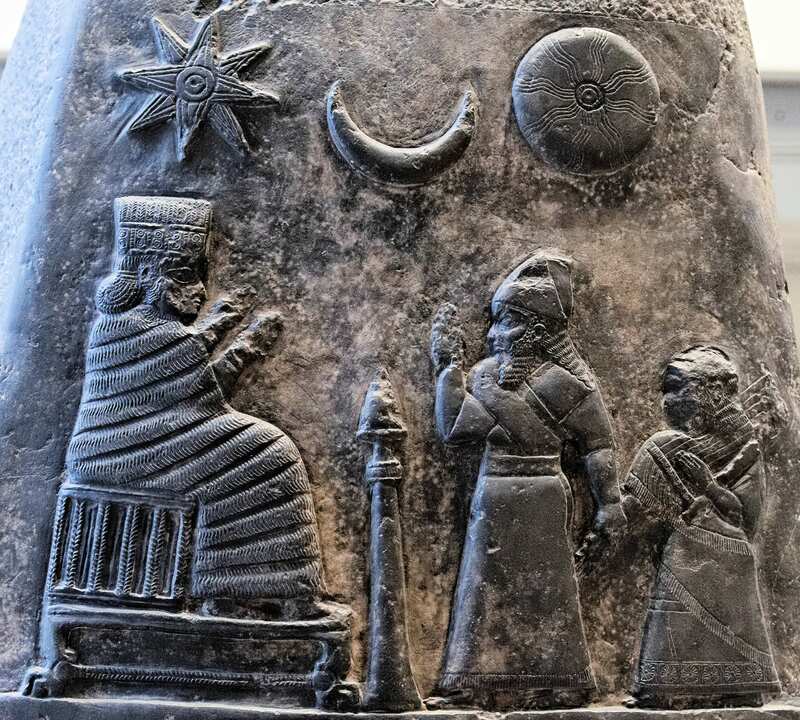 “Mene Mene Tekel Uparsin” — the words written on the wall of Babylon the night of her fall, and the death of her king, and the humiliation of her moon-god “Sin”, whose festival they likely were celebrating that night. They worshipped Sin and praised all the gods that night, and they used the stolen utensils from Yahweh’s temple to do it, (Daniel 5). “So they brought in the gold goblets that had been taken from the temple of God in Jerusalem, and the king and his nobles, his wives and his concubines drank from them. As they drank the wine, they praised the gods of gold and silver, of bronze, iron, wood and stone. Suddenly the fingers of a human hand appeared and wrote on the plaster of the wall, (Dan 5:3-5). Important note: this reexamination of Mene Tekel Parsin was not intended to be lengthy. I hoped to wrap it up in a few days. It took two months instead. 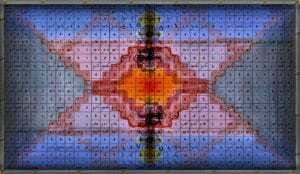 This means that the information in the next three articles is somewhat erratic in that I was learning as I wrote. Please keep this in mind. It means that the reader must actively piece some things together. The Enoch calendar is still my main area of study at this time. Ever since the fall of Babylon, scholars have pondered these four words written on the wall, searching for additional meaning. Why search for meaning beyond how Daniel interpreted the words? It’s because these same four words are loaded with other possible meanings, all of which make sense in the context of the fall of Babylon. They contain obvious multiple plays on words and much more. This leads to the conclusion that Daniel merely revealed the essential message, and that is all. No more needed to be said to God’s enemy about to be slain. Short and to the point. But it is a mistake to think that there is no more mystery within those few words. But there is more than mere quintuple plays on words here. When one adds to this the hypothesis that these four words were laid out in an array (as the ancient Rabbis believed), then its a little like Alice in Wonderland — the puzzle reads in all directions. 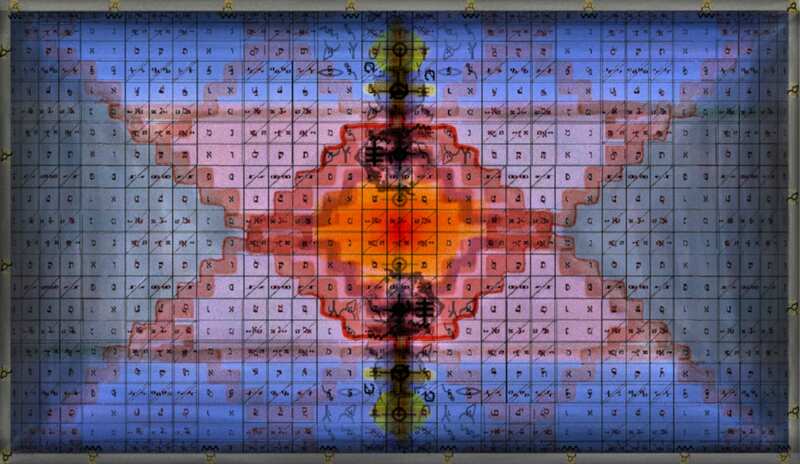 Up, down, around, and pictorially, and in multiple languages when transliterated, as we shall see. 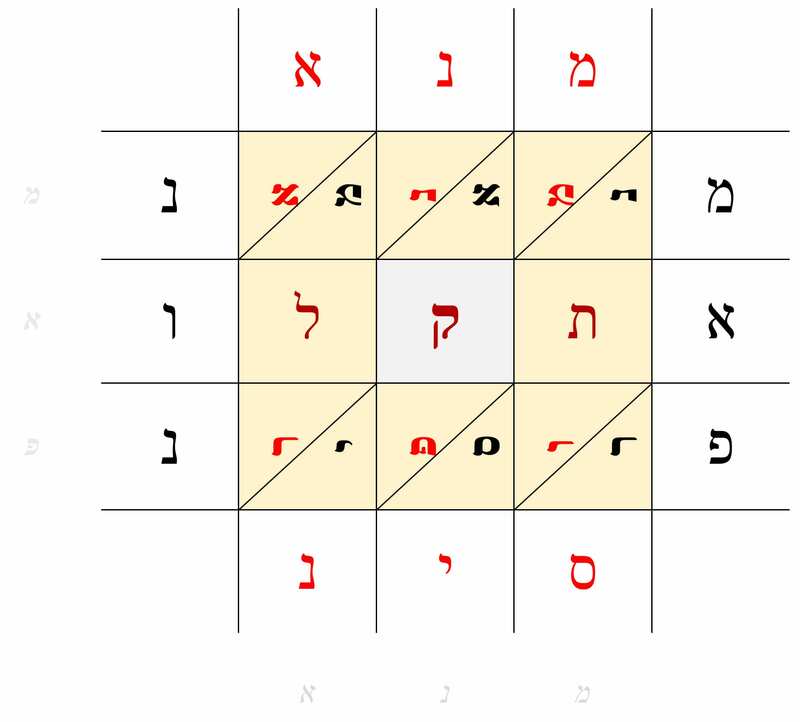 Even the middle three letters in the array (see above image) נקפ “Neqoph” mean to ‘besiege or go around’, and the word נקפ is indeed encircled by the remaining 12 letters, encamped, as it were, around her. And that night, Babylon was indeed surrounded/ besieged by Persia. And I confess, I lack self-control. The bush does not burn out. The lamp remains lit. And taking a second look has consequences. All who look are tested. And if judgment begins at the household of God, what will the end be for those who do not believe in Jesus? For example, “mene” “tekel” and “parsin” were three coins and weights, something that Daniel did not mention, although obvious. 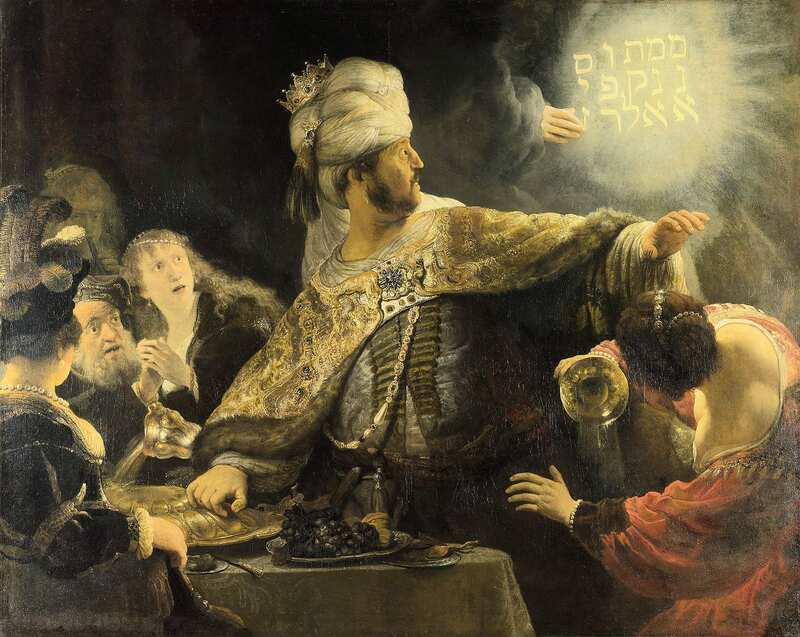 Also, “Parsin” was related to the word for Persia, thereby reinforcing Daniel’s interpretation: “Peres פְּרֵס, Your kingdom …has been given to the Medes and the Persians פָרָֽס”. Moreover, “Parsin” in Aramaic and Hebrew sounds like פר סין “The bull of Sin”, (i.e., the Moon bull-god). This is not at all a stretch because there is good evidence that the festival held that very night as recorded in Daniel 5 was a festival to Sin, the moon-god, whose symbol was a bull! 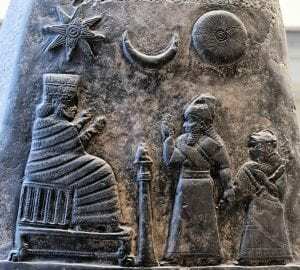 After all, Nabonidus, king of Babylon, was devoted to Sin above Marduk, the god normally honored by Babylonian kings. Why show off? Because “Nabu is the ancient Mesopotamian patron god of literacy, the rational arts, scribes and wisdom” (Wiki). God displays His unfathomable understanding of all literature and wisdom so that His people might be emboldened against the false gods who claim the same wisdom as God. God also shows off His omniscience in order to drive divine powers crazy (the real “shadow government”) so as to fulfill His ordained purposes regarding their rise and fall. In other words, phycological warfare creates division and fear within their ranks so that divided they fall, right on schedule. My hope is that this article will likewise embolden God’s people to trust God and not the shifting shadows of the theories of men. We live in an age when the priests of so-called science think that to demystify a thing is to dethrone God. However, the exact opposite is true. Concerning God’s boundless creativity, if it were not for hard hearts and deceiving spirits, the scientific community (who currently wield scholastic power) would by now have exclaimed, “Surely, this is the finger of God”. 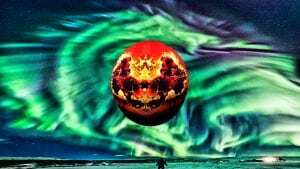 Instead, having been backed into a corner by God’s boundless Creation, they chose rather to believe in multiple universes and other such nonsense in order to vainly explain away unbounded intelligence. They don’t realize it, but they have flown over the cuckoo’s nest. The symptoms of Nebuchadnezzar madness, that of growing feathers and claws like a bird, is upon them! 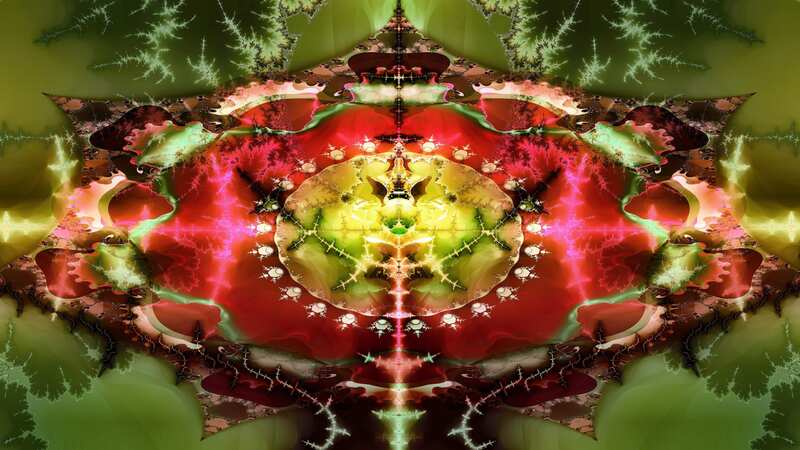 But God calls it “strong delusion”, whatever form the age-old doctrine of reincarnation takes. 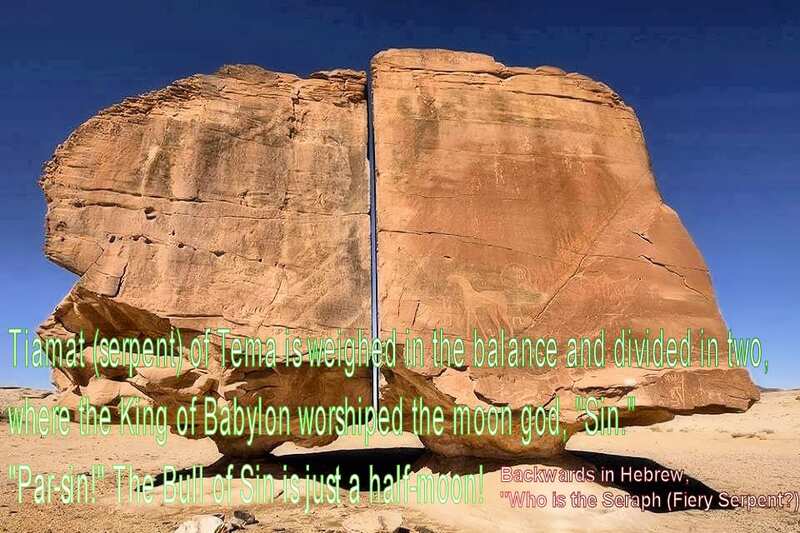 Moreover, Mt’ Sinai is also named after this same moon-god. And it happens that the journey from the Wilderness of Sin to Sinai took exactly half-a-moon, that is, the dividing (“parsin”) of a moon later! And so the Lord “judged the gods of Egypt”, who in turn epitomized all other false gods. As we shall later see, this moon-god of Ur, Haran, and Babylon is addressed more frequently than all the others in the Mene Tekel Code. And so what happened that very night? That night, just after the full moon, the wicked king of Babylon was put to death. It was at the same time that Jews elsewhere were celebrating God’s ordained festival of Tabernacles by sleeping in temporary shelters. Daniel would have built one too. Given the meaning of Tabernacles, Jews would have taken this stunning contrast of lawful versus unlawful festivals as a portent of their imminent return from Babylonian exile. In particular, they would recall the Wilderness of Sin when the 40-years of manna began, and Mt. Sinai, which was the previous time that God wrote His word on stone with His finger. The above four examples of hidden meaning within the four enigmatic words written on the wall are hints that behind them lay a greater code. The true depth of which is beyond human understanding, something that caused not only men, such as Belshazzar, to tremble, but indeed, powerful unseen fallen angels masquerading as gods to collapse to their knees also. Of this, I have no doubt. It would have driven both the diviners and the fallen entities whom they served to madness, a riddle so deep and wide and all-consuming, yet extraordinarily simple at first glance. Nebu went numb! Bel’s (Bell) head is ringing. Exposed before men and angels for the fraud they are. Note the reminder of Daniel to Belshazzar that same night concerning the seven-years of madness of Nebuchadnezzar, Dan. 5. 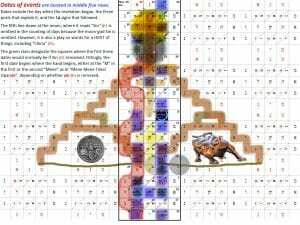 Is it a mere coincidence that seven years of years have passed since the fall of Babylon in 539 BC, unto AD 2000 and 2018, according to a seven-year period on the lunar calendar and on the solar calendar? Mene, Tekel, Parsin were three ancient coins, as discussed at length 19 years ago. 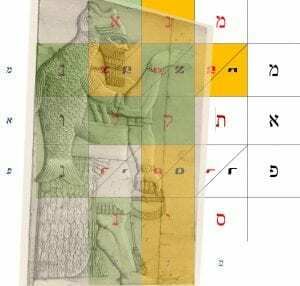 The encoded message predicted (among other things) the events that led to the Gulf war and the exact day of the death of the ‘king’ of Babylon (Iraq), that is, Saddam Hussein and sons, which was 3.5 and 7 years from the day that it was reinterpreted. 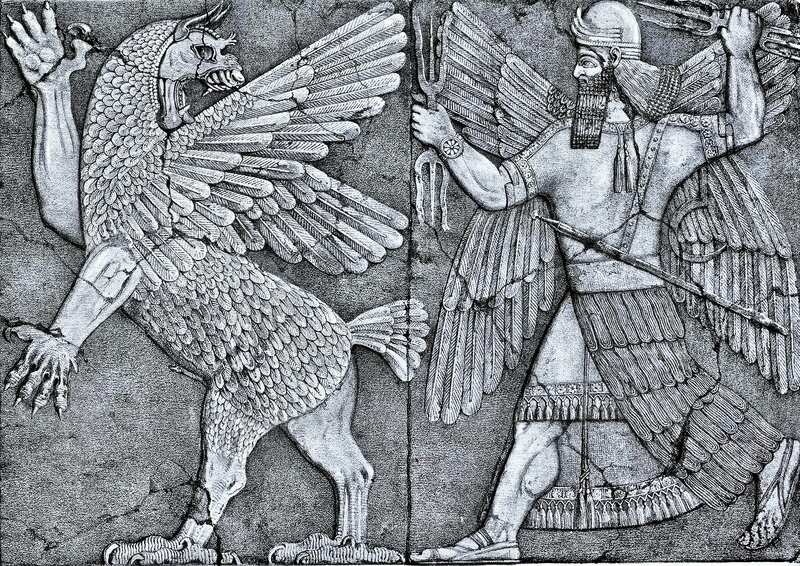 But now, this time, once again, 19 years later, these four simple words “Mene, Mene, Tekel Uparsin” are further opened up to reveal the message that the gods of Sumer/Babylon would have detected, and the details of the spread of the mystery of iniquity from Babel to now. This second reinterpretation began Nov. 23, 2018. This day was also Kislev 15th, the anniversary of the “Abomination that causes desolation” on Kislev 15th, which was 6*364 years ago to the very day, in 167 BC. This altar was built to Zeus, but to the Egyptians was known as Amun. 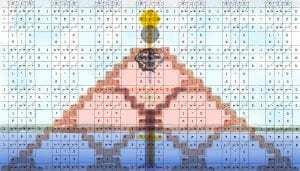 Min-Amun is the very one initially addressed in the reexamination of the Mene-Tekel code, as we shall see. 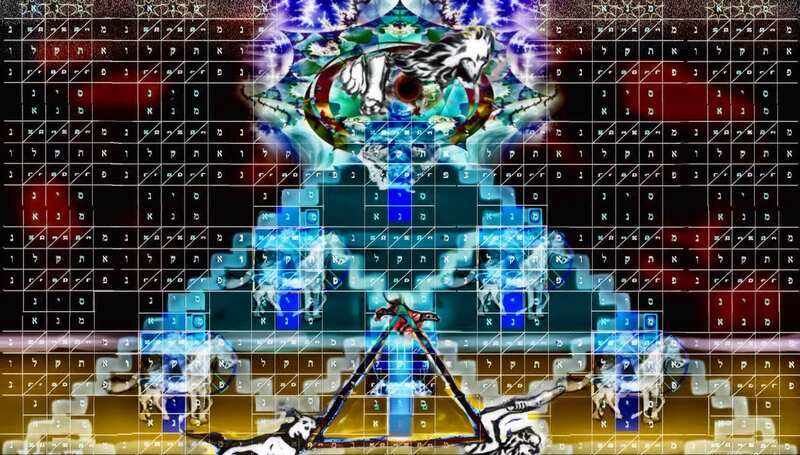 These two interpretations of Mene Mene Tekel Uparsin (the one in Feb. 2000 and this one in Nov. 2018) are meant to be overlayed into one message, along with their images/idols. The overarching message is this: “The banner of the cross will defeat them all”, and, “Every knee will bow!”. 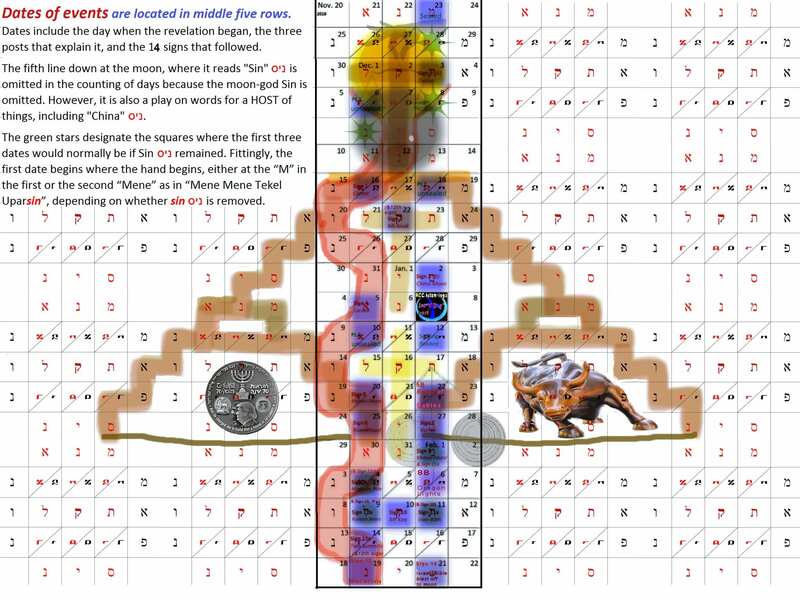 This second message (addressing the ‘gods’ of this world) is revealed when both images of the above coins are overlayed. This results in the complex word-puzzle seen below. Important example: click here for the flash video that was put out in the year 2000 that overlays the coins into a cross. You will have to click "allow" to allow the flash to play. Important: This short video will greatly help you to understand the basics of how this code works. Why Coins? Why a Cross? And why a spectacle made of the gods? Mene, Tekel, Parsin were three ancient coins, as discussed at length 19 years ago. In those days, ‘coins’ and ‘weight’ meant much the same thing. These three coins represent the debt owed by mankind to God due to their sin. It also represents “the great weight of His wrath”. The lightweight coins symbolize the worthlessness of the gods of this age, and those that worship them. 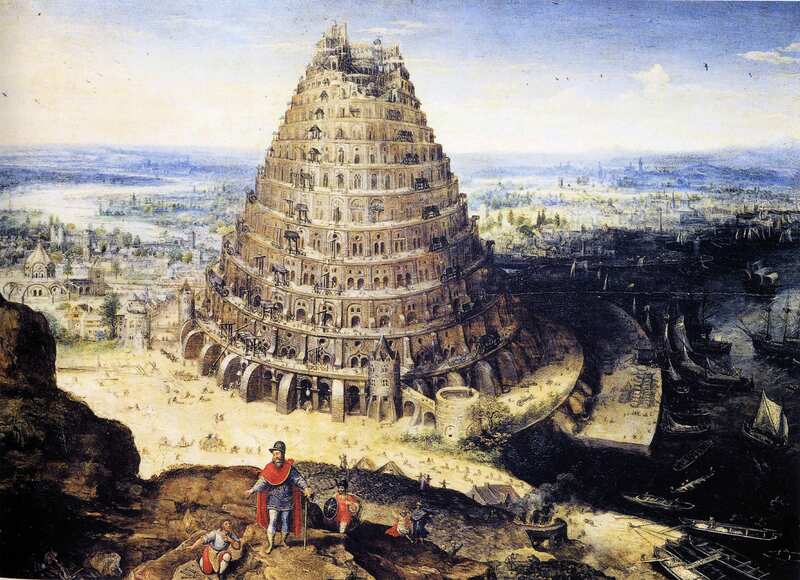 The writing on the wall occurred at the fall of Babylon in 539 BC, (Dan. 5). The year 2000/2001 (when the Trade Towers fell) was seven years of years from the fall of Babylon on the lunar calendar (that is 2538/9 years). 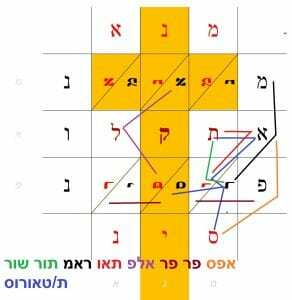 However, this time the reinterpretation of Mene Tekel Peres comes seven years of years on the solar calendar instead, (that is, 2556 years). “Mene Mene Tekel Peresin”. Overlapped Vertical and Horizontal. 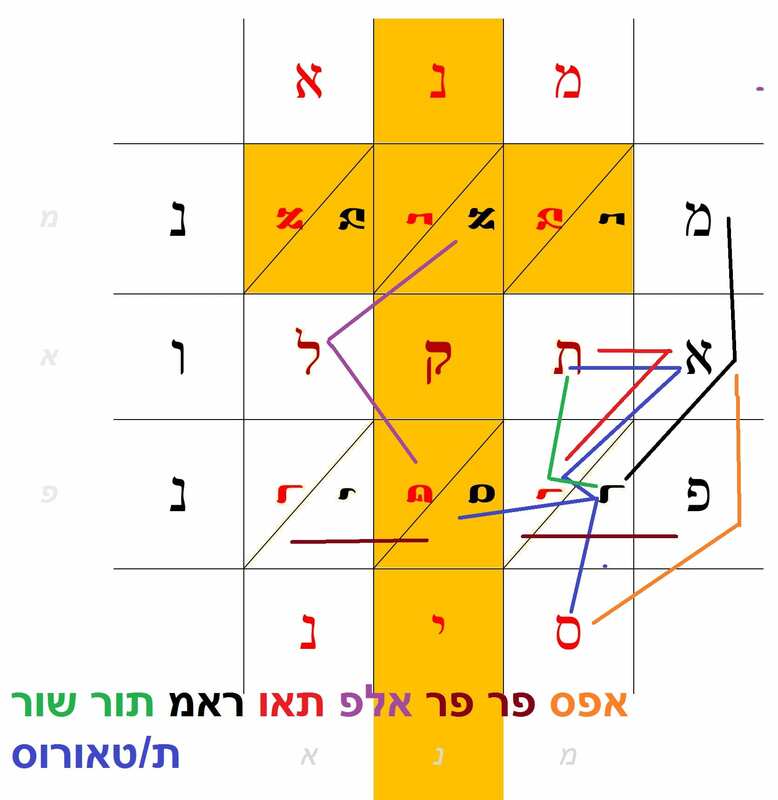 מנא מנ-אמנ. 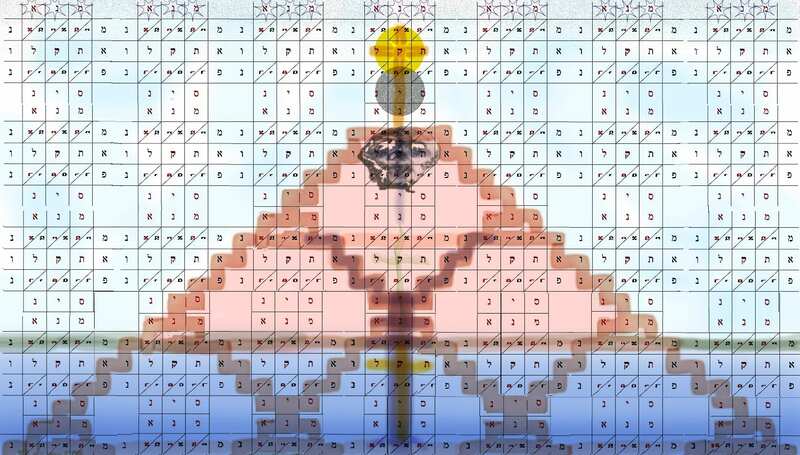 אשקלו פרס פרינ סינ “He numbered Min-Amun! I will weigh him! 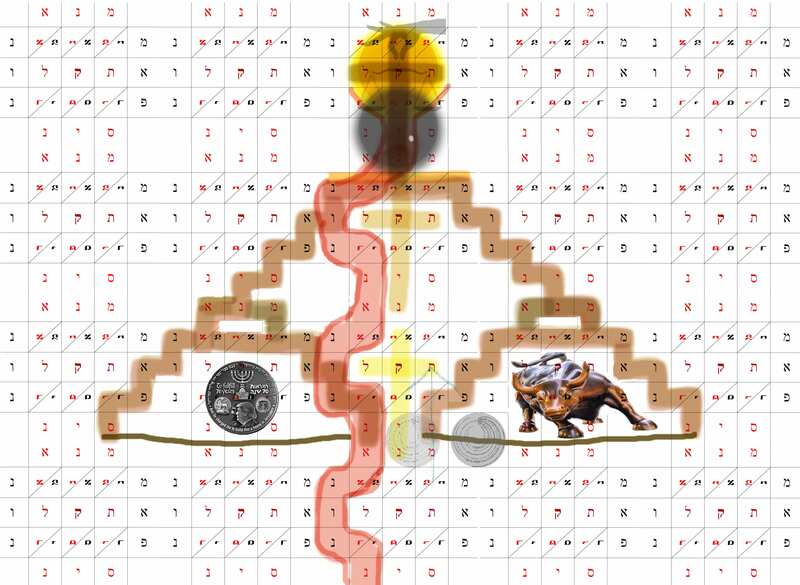 He divided the bulls, O’ Sein (i.e., the crescent-moon god)! The stone is located in the land of Tema/Tayma, in Saudia Arabia. It seems obvious that the Mecca stone (to the south of Tema) has replaced this split stone. Formerly, Tayma was called “Tiamat” (the serpent). Apophis is the Egyptian equivalent. At the sure.foundation website, I mention “Kenan” in passing. “Kenan” relates to our series about Enoch, and so I want to elaborate on it briefly here. In the Bible, Kenan had his first child at 70, and lived another 70*12 years, for a total of 910 years. 910 years is 364*2.5. 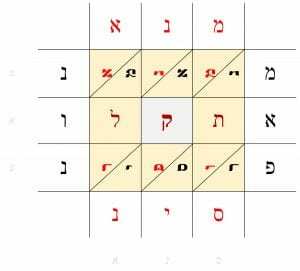 The unique name of “Kenan” in Gematria. “210” is also 70*3. Compare this to his age. Kenan is a type of Jesus, the sin-bearer. “He was numbered with the transgressors,” transgressors among both rebellious men and angels. The name Kenan is in parallel with Cain, the first transgressor. The seven Apkallu are portrayed as seven fish-beings in ancient images in the land of Sumer. These seven replace Adam to Enoch in the Bible, with “Kenan” the middle of the seven replacement-Apkallu. 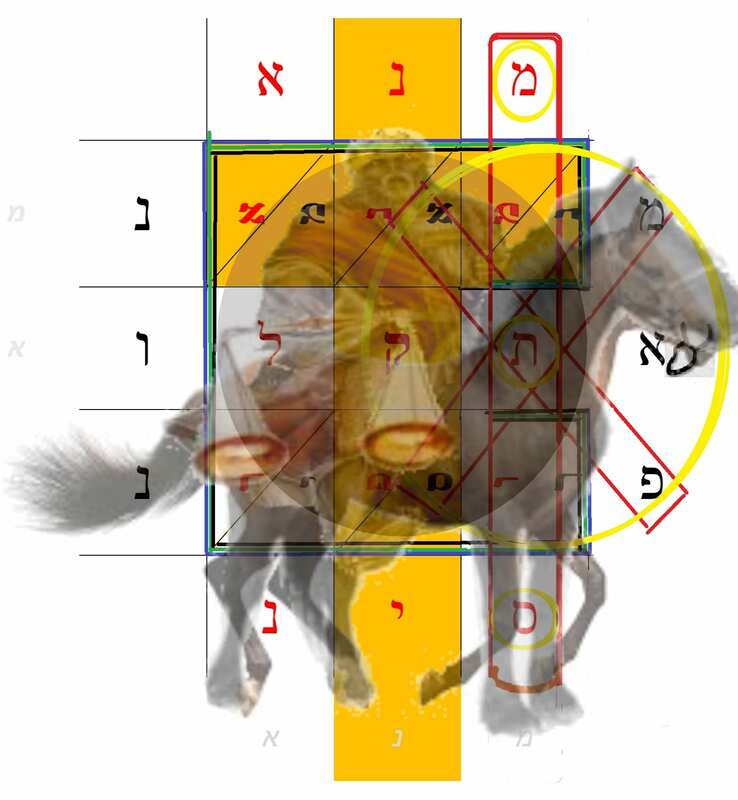 The lower right corner where the names all occur (other than Aleph) will form the bull of Aphis of Egypt. 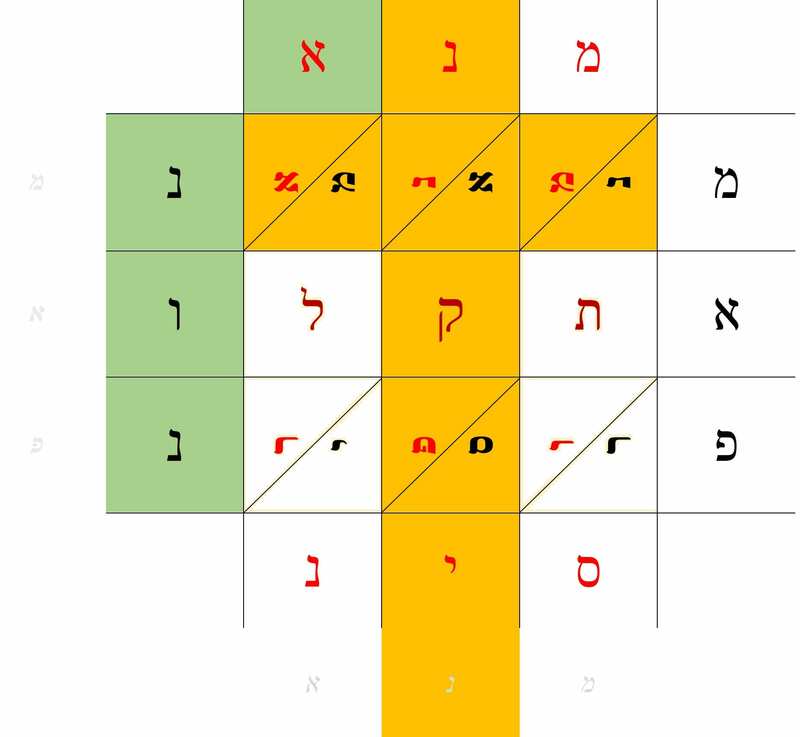 Various Hebrew and Aramaic words for “bull/ox” surround the lower areas of the cross. 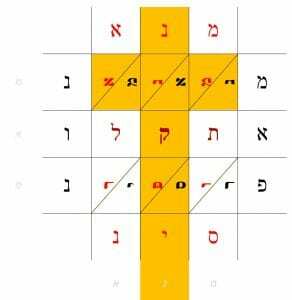 The cross can also read: “He numbered the ones surrounding/besieging.” For example, both Sin and Amun were both symbolized by the bull. These bulls are examined more extensively at this link. 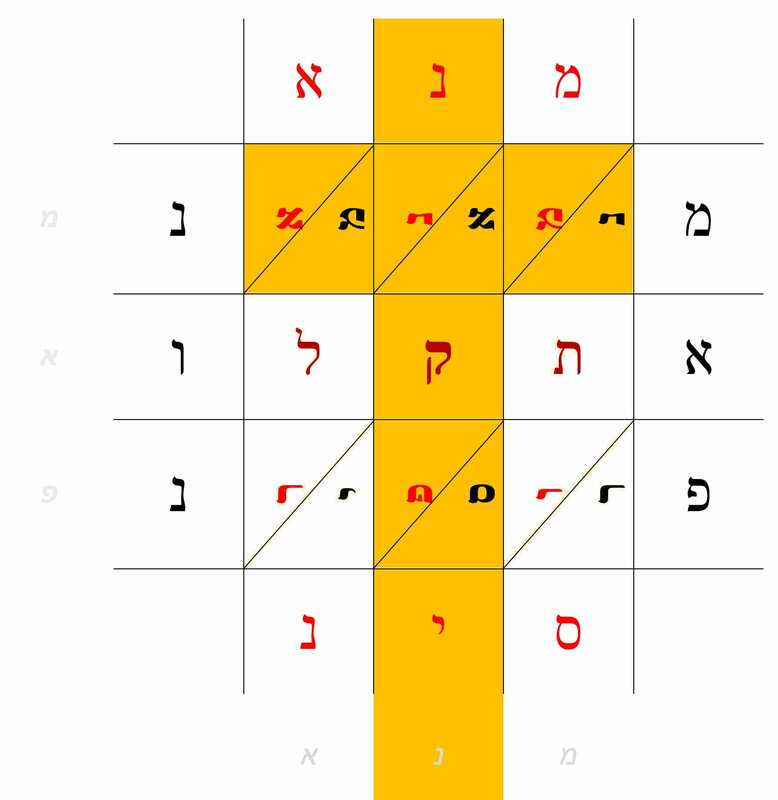 Notice that one-third of the 12 letters within the cross are the letter “nun/nuna נונא” (spelled in full at the left side of word-puzzle). “Nun” is fish or serpent in Aramaic. 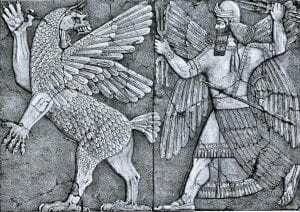 The Anunnaki are also called Anunna. (“Ki” is just a suffix meaning, “earth”). The seven are usually portrayed as wearing bull horns. 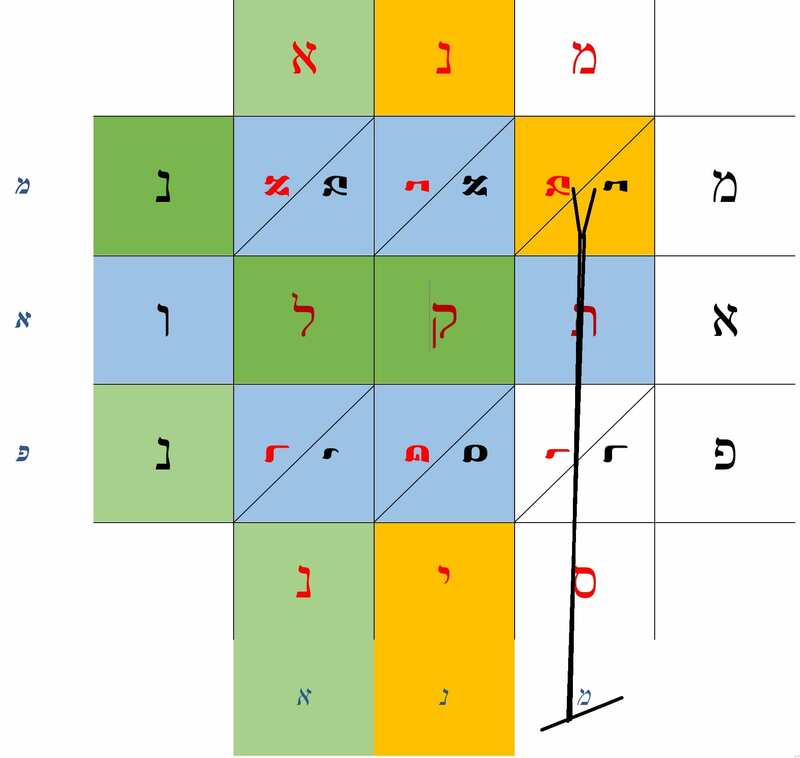 Anunna is spelled (at left) “אנוננא.” It, too, has the general shape of the Apkullu. Moreover, the fish that the “god” is draped with is positioned precisely to the word “fish” “אנונ” as seen below! 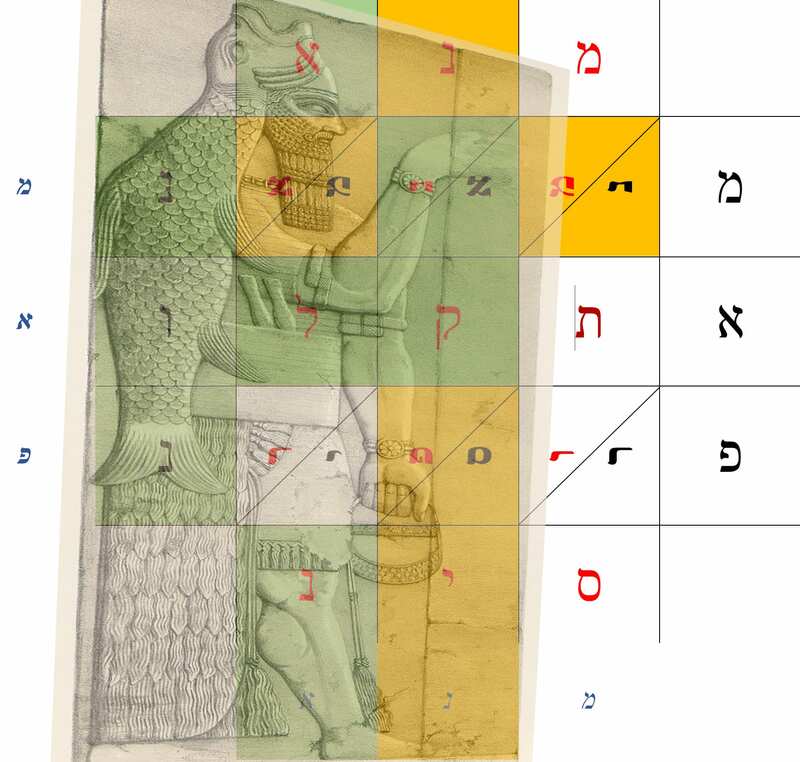 Compare the shape of נונא “Fish” in the code with the position of the fish in this image. Green squares read אנוננא “The Anunna” (Annunaki/Giants). The arm that offers the forbidden fruit reads, נקלנ “We are cursed!”, and is a play on words for Apkallu and Shekel, and is what the Watchers say in the book of Enoch, (ch. 6). “Then they all swore together and bound one another with a curse.” (Also see Gen 8:21. ) It takes little imagination to see the silhouette of the image to its right, even when restricted to square blocks. 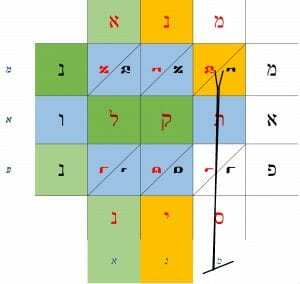 The word for “a god”, El, “אל” is also here. Amun, chief deity of Egypt. 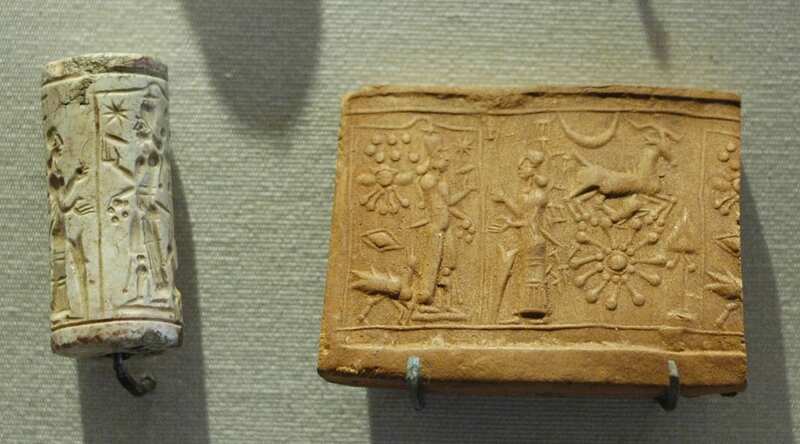 Mesopotamian limestone cylinder seal and impression—worship of Shamash (sun god). Notice how seal imprint at far right repeats itself. The word-picture code does the same. By the time we come to Islam, the cylinder stands erect in the form of a minaret with a voice crying out from its top, along with the crescent moon and star above. Mountains and valleys are formed below by the words, “The faith of the Holy Koran is being proclaimed by the Imam”, as a double-weaving twisted serpent arises from Kor (the underworld) that proclaims, “Allah of Islam is Holy!” The moon and star are formed by the words, “Sin” (the crescent moon god. and “Ishtar” (or just “star”). In the second part of “Mene Tekel Uparsin, The gods are Judged!”, we build upon what we have looked at so far. After a brief look at Islam and Catholicism, we will ponder the seven seals of the Lamb broke open, which ties everything together. DEAN COOMBS told us the date that Saddam Hussein would die,,,,and the method of death (noose)……3 months in advance………i marked my calendar and waited 3 months,,,,,,,,,Saddam died on the predicted day, in the predicted way…….I am eye witness,,,,,,the first physical miracle that i ever saw…….it was fantastic……. Next Next post: Part Two. Mene Tekel Upharsin: The gods are judged!